The owner Orhan Utan chose the name Lampa because of his love and appreciation for antique gas lamps. The word “Lampa” means lamp in several different Turkish dialects, as well as in several other languages. The owner Orhan Utan chose this name because of his love and appreciation for antique gas lamps. Mr. Utan has been collecting lamps for the past 15 years. His collection includes nearly 200 pieces and every piece is being hand selected and sometimes even repaired by him personally. As an avid collector, Mr. Utan to this day is always in the search of the perfect new pieces to add to his ever-growing collection. 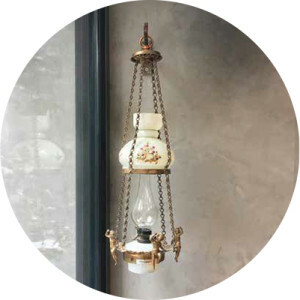 It is not a coincidence that Mr. Utan’s enthusiasm for gas lamps has inspired the design of the newly opened hotel. Lampa hotel introduces a unique “boutique design hotel” experience with the warmth of the antique gas lamp and industrial minimalist architecture. The building incorporates some of the antique gas lamps from Orhan Utan’s collection within a mixture of industrial modern design, natural wood parquet, marble staircases, cast-in mosaic and generous use of metal hardware. In addition, the art pieces and enchanting facade detail conceived by Architect Selami Çiçek add the finishing touches to this exquisitely devised hotel. The Lampa Lab, where guests can enjoy their delicious breakfast and afternoon coffee, exhibits the remarkable touch of the architect Nilüfer Kozikoglu and the patio is adorned with Fem Güçlütürk’s terrarium designs.